Strata Legislation Handbook NSW 2016â€“17Â contains explanatory commentary and the text of the new strata regime legislation which commencedÂ 30 November 2016. It is designed to assist those involved in strata schemes, including solicitors, lot owners, owners corporations, strata committees, strata management agents, building managers, developers, construction builders and tenants, to understand the principal changes affecting them and the steps required to ensure compliance with the new laws. This book contains the Strata Schemes Management Act 2015, Strata Schemes Development Act 2015 and associated Regulations which form the new strata regime. 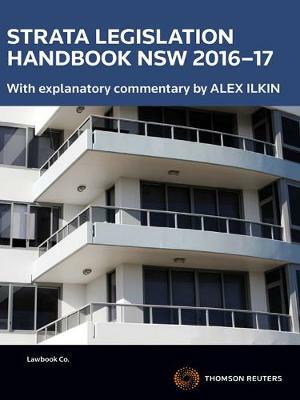 Alex Ilkin, expert strata lawyer and author of the highly regarded text NSW Strata and Community Schemes Management and the Law 4th edition, has written clear and concise overview commentary on the NSW strata reforms. As well as providing background and context to the reforms, the commentary highlights significant changes to the law and provides detailed practical guidance for those navigating the new regime. Where former strata law principles are still applicable, cross-references to the 4th edition of his book are included together with a summary of leading cases which will be included in the 5th edition of his text (forthcoming, 2018). Included are detailed comparative tables setting out the old and new strata legislative provisions side by side. Â See "Table of Contents" below for detailed list of commentary and Forms.